The Indonesian Democratic Party of Struggle (PDI-P) has prepared a team to monitor the vote-counting and recapitulation processes. “We have prepared an information-technology team that will monitor polling stations [TPS] for a full 24 hours,” PDI-P secretary general Tjahjo Kumolo said on Monday as quoted by tempo.co. He said the establishment of the team was aimed at monitoring potential fraud in the legislative poll, especially during the vote-counting and recapitulation processes. The monitoring team will be centered at the party’s executive board headquarters on Jl. Lenteng Agung, South Jakarta. The monitoring team will be divided into two teams. The first team comprises 150 officials who will monitor and recapitulate votes from 77 electoral districts. Each official will receive and record results from the real vote counting conducted in a TPS. The data to be recapitulated will come from witnesses dispatched by the PDI-P to every TPS. The second team, which comprises 35 officials, is assigned to monitor vote movements from the lowest to highest levels, starting from the TPS until the General Elections Commission (KPU) headquarters in Jakarta. The team will also monitor potential fraud possibly indicated by discrepancies between the number of votes collected in the TPS and by the KPU. “Every discrepancy will be detected and we will immediately process it,” said Tjahjo. 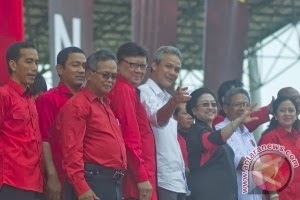 Ahead of the legislative election on April 9, the PDI-P had made the special preparations as it did not want bad experiences, as happened in the 2004 and 2009 elections, to be repeated again, Tjahjo said.